How you can develop a launch plan or re-launch plan to make the most of good PR and set your business plan rolling. 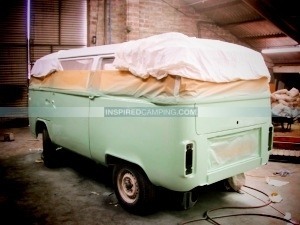 So what exactly do you need for a new camping and glamping business idea to work in 2019? Also, you can’t simply offer a camping experience and dress it up loosely as a glamping one and expect customers to buy your service. If it’s a glamorous and luxurious experience they’re after then that’s exactly what you must deliver. How that is delivered depends very much on the service you choose, so we have drawn on the experience of our readers to give you an example of how one company has started their business. Jess and Ben run The Cornwall Camper Company with an ethos of providing a high quality service by restoring and hiring vintage VW Campervans for holidays, weddings and events. We started a journey in 2010 that was made up not just of VW Campers and beautiful places and “glamping” around Cornwall but a journey that took us down the road of blood, sweat and tears. This was the very start of a brand new business – a dream that we are now seeing become a reality. Over a glass of wine on a camping trip during a freezing night in April my partner Ben wistfully announced that he had always wanted to own a business and I asked why, when approaching the grand age of 40, he had not actually done it yet. 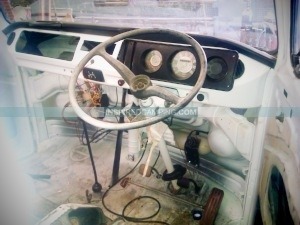 The next day we bought two beautiful, but derelict old VW Bay Windows. The old couple were desperate to see the vans restored to their former glory – having unwittingly left them to rot in their field for ten years. We made a promise that day that we would see their vans back on the roads doing what they do best – giving people wonderful holidays and memories that will last forever. We started by having to source every single part that we could not recycle and re-build. A huge part of our business is our real pride in being sustainable and re-using every part that was not crumbling. Ben welded, and soldered and welded some more, even hand crafting parts rather than buying new and sending something old to landfill. It took months of late nights and weekends – at the time he was still working at his day job as an adventure centre manager. 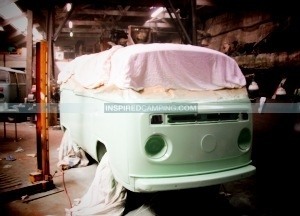 Finally after we had stripped and created and built our dreams on a crumbling old van, she started to look like the shadow of what she had once been – standing naked – but proud in the workshop. This part took so long that we decided at the end of 2011 that if we were going to be serious about this business that Ben would need to give up his job and work on the vans full time if we hoped to have two vans on the road for a full season in 2013. We became very good friends with the operators on the phones at VW Heritage and also Just Kampers – their advice and expertise have been a Godsend to us. Ben faced a huge challenge with the spraying and I would advise that if you are not handy in any way with a spray-gun that you get professionals to do it – but that was not good enough for Ben. He was going to see this van through to the bitter end – and he was going to do almost all of it himself. Hours of practice later and he let himself loose on the van and he could not have gotten a better finish if he had got the best in the business to do the job. 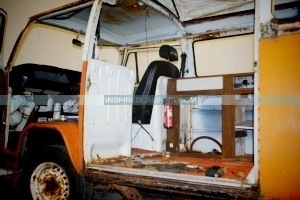 With a gleaming shiny van – kitted out and sat on the ramp it was time to get under the rear-end so to speak and work on the electrics, the engine, the exhaust system – obviously, there was so much to do and here is where the help from professionals really got going. A wild haired electrician came around and after hours of muttering and swearing everything was wired up including what we considered to be the special and essential parts – the three-way fridge (it can work off gas a hook up and a battery) and the stove and sink – what more do you need? Food and cold beers! The engine was rebuilt as a project by some fantastic mechanical students in Cornwall and boom – all of a sudden we had Lilly the VW Campervan – ready to pass her MOT with flying colours. Exactly one year and eight months after the original conversation we were ready to rock and roll and repeat the exact same process on our second van. Starting a business is not just about getting the Campers on the road and getting the customers – it’s about having a strong ethos, achievable aims. It’s about being dedicated and understanding what you want to give to your customers. For us, it’s all in the details. It is about providing experiences that people will remember for the rest of their lives. The details are about making their holidays seamless – as if it is the most natural thing in the world to live in a VW Campervan. We have really concentrated on the journeys our customers take, if they want to discover adventure – then we will provide surf lessons, coasteering and rock climbing. If they want to experience the wilderness of Cornwall then we know where to go and what to pack. If it’s an exploration of the vineyards of the county then we can provide the whole package including the wines. It’s also about what’s in the van – the quality of the contents. The ability to step off a plane and into the van with nothing but your toothbrush. That’s what we feel holidays should be about – complete and utter freedom. So while our journey started nearly two years ago – we are still just at the beginning. With two vans under our belt – we are at the very cusp of doing what we want to be doing –giving people the same first class experience that we would want ourselves. I feel honoured to be one-half of a brand new company. 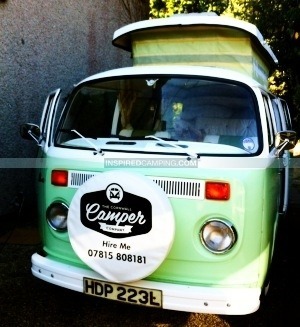 We are young, fresh and excited to unleash ourselves into the world of VW Camper hire holidays. Watch this space – The Cornwall Camper Company has landed and parked up! With a career in travelling and DJ’ing behind him Ben settled down in Cornwall 10 years ago to work as an Adventure Center Manager, organising and teaching surf trips, coasteering (traversing the Cornish coastline), rock climbing, mountaineering, kiting and kayaking. Now he has successfully and beautifully rebuilt two vans from scratch with two more waiting in the queue. With ten years of Eden Project PR under her belt and a year at the high profile, TV Production Company, Twofour, Jess relishes the challenge of making sure their business becomes the most talked about VW hire company in Cornwall. Between them they make up the team behind The Cornwall Camper Company.